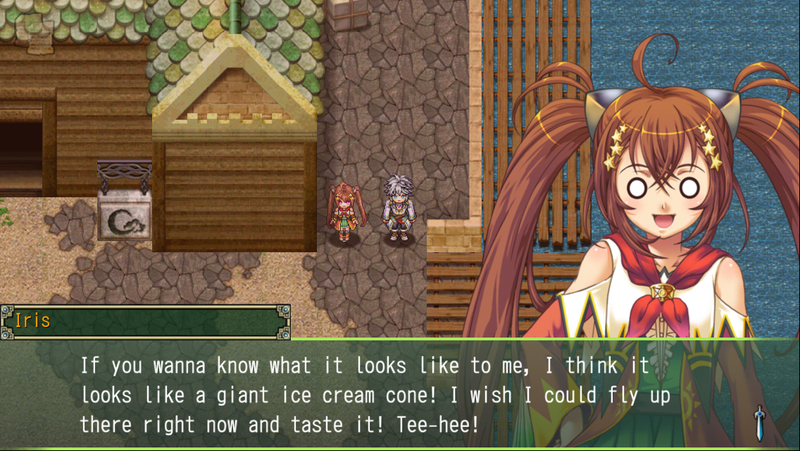 I feel like I’ve written about this before, but Kemco and their developers have an odd approach to sequels. They’re not too big on them, for starters, with only EXE-Create among Kemco’s stable of developers doing them with any sort of regularity. Then, when they actually do sequels, there are virtually no links at all to the previous games, save perhaps a single character or location that reoccurs. They’ll even completely change the gameplay systems to the point that no one would be able to guess it was a sequel if it weren’t labeled as such. It’s not something that bothers me much in general, but Asdivine Dios (Free) is one case where I would have appreciated a safe sequel. I’ve made no secret of my opinion that the first game, Asdivine Hearts ($7.99), is the best game in Kemco’s iOS line-up, and I was rather excited to hear the series would be continuing. While Asdivine Dios is a sequel, and even shares specific gameplay elements with one of EXE-Create’s previous releases, it feels less like a sequel to Asdivine Hearts than it does Revenant Saga ($7.99). Sure, it’s using the 2D gameplay engine found in Hearts as opposed to Revenant‘s 3D engine, and it does feature a world named Asdivine, but many of the other systems closely resemble those of Revenant Saga. The worst of it is, they’ve ditched the gem system used for customizing characters, one of my favorite parts of Asdivine Hearts. On top of that, the translation feels like one of the weakest I’ve seen from EXE-Create in some time, lacking a great deal of the wit and charm found in Asdivine Hearts. Simply put, if you’re here for a game that builds on Asdivine Hearts in any sense, you’re probably going to be disappointed. If you can let go of those expectations, however, you’ll find there’s still a reasonably enjoyable RPG here with a couple of fresh ideas. 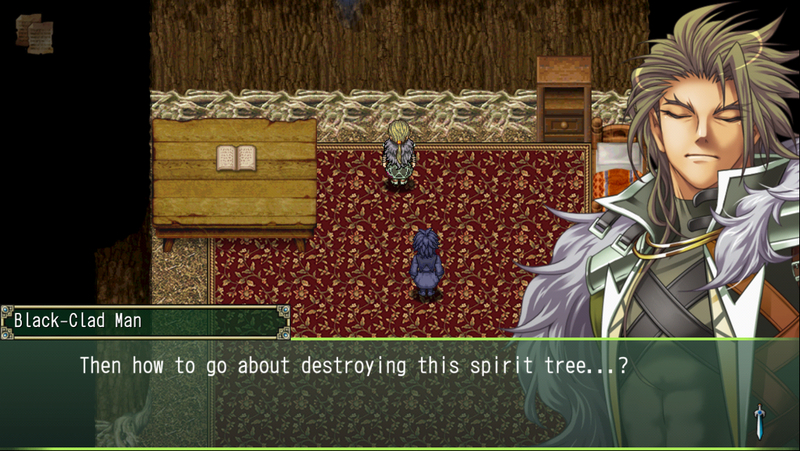 To begin with, your main character, Izayoi, isn’t a simple country orphan like many of Kemco’s other protagonists. Instead, he’s the main deity and creator of the world. An event at the beginning of the game leaves him and his helper spirits heavily de-powered, and he needs to figure out what went wrong and set it right before the world itself pays the price. It’s an interesting spin on the usual divine test story, and a nice complement to the first game. Like in the first game, our hero soon finds himself surrounded by a party consisting entirely of women who are romantically interested in him, and depending on who you show the most favor to, you’ll end up with one of a few different endings. Before we go on any further in this review, I want to address the two different versions of the game. Asdivine Dios is available in both a free and premium version, with the only difference between the two being that the premium version starts you off with a rather large chunk of the game’s premium currency. However, in addition to the usual cheat items found in other EXE-Create games, you’ll notice the shop is carrying a few items that alter the balance of the game’s reward distributions. The sum of points that the premium version gives you allows you to buy five of these items, doubling experience, drops, ability points, gold earned from battles, among a couple of other interesting choices. If you choose to play without any of these items unlocked, you might find Asdivine Dios to be a bit more grindy than previous games from this developer. It’s still not too hard to beat the game without them, but the intention here is clear. If you want a normally-tuned experience, buy the premium version and pick up the doublers with the points you’re given. The general progression is no different from any other ordinary JRPG. You’ll visit new towns, get sent to dungeons to solve some sort of problem or another, fight a boss, then head on to the next town. Each town sells incrementally better equipment than the last, offers up a new sub-quest or two, and occasionally allows you to participate in an event to improve Izayoi’s relationships with his fellow party members. The battle system also plays things straight. 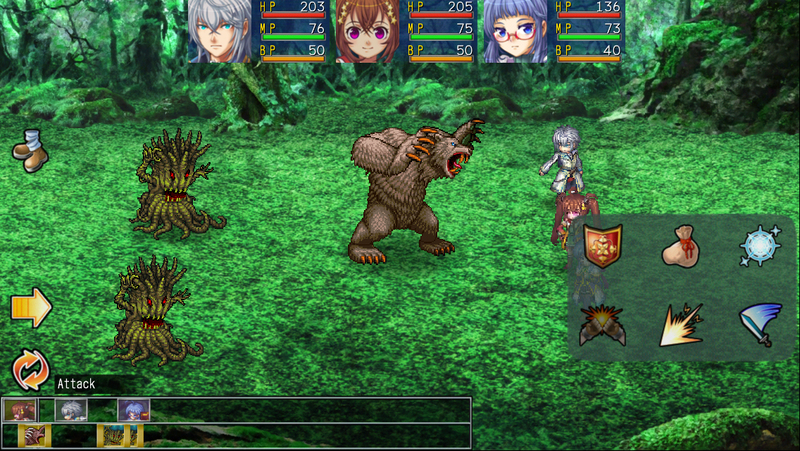 Encounters are random and turn-based, with an action bar letting you know the order of each participant’s turn. When a player’s turn comes up, they can attack or use magic, items, or skills. Like most of EXE-Create’s RPGs, the battle area is split up into rows and columns, with certain skills targeting particular points on the grid. Unison attacks have been in other games from this developer before, but they allow you to combine the skills or magic of two different characters to unleash a powerful new move. Nothing too exciting, but it works well enough. There aren’t as many options for customizing your characters in Asdivine Dios as there were in Asdivine Hearts. You can equip special elemental rings that will teach characters magic spells as they level up, and you’ll find the occasional stat seed that lets you do a little tweaking. In this game, most of the customization comes in the weapon system. It feels like a weird hybrid of Shin Megami Tensei ($7.99)’s demon fusion system and the evolution/leveling systems found in many social RPGs. Weapons have base stats, but they can be leveled up by feeding them other weapons. They might also have other properties, like putting the enemy to sleep at a certain rate. You can transfer these traits to another weapon using a fusion system. To support this system, there’s a new mini-game called Barrel Busters where you can exchange tickets earned in battles for a random weapon draw. Barrel Busters requires you to briefly connect to the internet, but you don’t need to make use of it if you’re not able to. It’s mostly a source of junk weapons to feed to the ones you’ll find laying around anyway. The weapon system is fun, but it feels like it’s not used to its full potential. You can proceed as you would in any other RPG, buying new gear as you hit each new town, or making use of the stuff you find in treasure chests, and you’ll be totally fine outside of a few optional bosses. It makes it too easy to ignore, and if you decide not to pay attention to it, there’s very little to play with in terms of character and party development. Furthermore, unless you crank up the difficulty, you’ll find Dios is lacking a bit in challenge overall. Most players with any RPG experience would be well-advised to pass on the normal difficulty and go straight to hard. Unless, of course, you enjoy steamrolling enemies while simply taking in the story, in which case, party on, friends. The game takes about 15 to 20 hours to get through, depending on how much you concern yourself with side content, and with multiple endings and optional content, you could easily get dozens more hours out of it. Asdivine Dios has an enjoyable cast of characters and is competent in the way that all of EXE-Create’s RPGs are. Unfortunately, the new weapon system is a poor replacement for the outgoing gem system, which means the story is the only distinctive quality the game can lean on. The spotty localization manages to hurt even that, with a generally awkward and occasionally grammatically incorrect flow to the text that only shows flashes of the clever writing usually found in this developer’s English versions. The game also throws a brick in the air that won’t come down until the next game in the series, the yet-to-be-localized Asdivine Menace. I’m sure we don’t have to worry about that game not getting an English release, but it’s worth knowing ahead of time that a certain plot thread isn’t resolved in this game. It’s all a bit underwhelming, but that might be partially my fault for expecting too much from Asdivine Dios. This is a decent game, good enough to be worth a JRPG fan’s time if not necessarily anyone else’s. 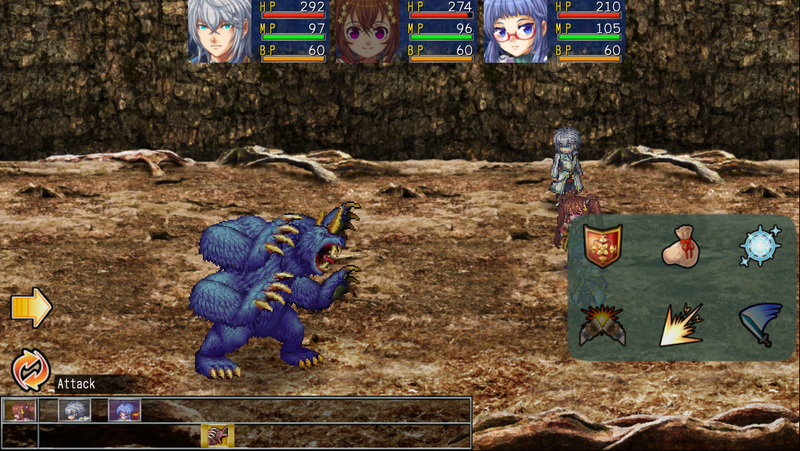 It brings very little of interest to the table apart from its unusual protagonist, but it executes the basics well enough to elevate it beyond Kemco’s average fare. Not that much beyond, mind you, but it’ll do for now. Next PostNext Simogo Released ‘SPL-T’, a Simple-Looking Puzzle Game, But Is It Just That?